The Aquobex product range was enhanced in 2004 by the addition of Rapidam which in 2000 had been awarded Innovation of the Year by BBC Tomorrow’s World. 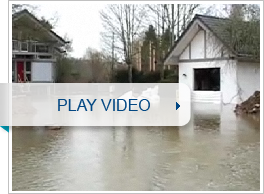 It subsequently achieved BSI Kitemark (1188:4) accreditation for temporary flood barriers. Aquobex was, for a long time, the only company in the world that could offer two BSI Kitemark accredited products. For larger, commercial premises, the complete area surrounding a building can be protected by Rapidam. Unlike other systems which are multi-component systems requiring a large amount of manpower, Rapidam is a single-component system requiring only minimal manpower/deployment time in comparison. Whilst other systems are cumbersome heavy engineering, Rapidam is a membrane system which uses water as part of the solution. The weight of water is used to seal the groundsheet down and to provide the stability to the entire system by retaining the back wall of the system via the tension straps. This eliminates the need for heavy components and means that 10m or more of barrier can be rolled and secured in just a few minutes. Rapidam, like Aquobex can be used in a more permanent manner for site protection. For instance it may be easier and more cost effective to build a perimeter wall in either brick or concrete to protect the majority of the perimeter or to move flood water from a sensitive area to an area less likely to be damaged by flood, yet access will still be required. 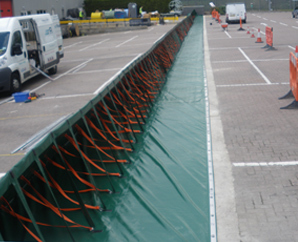 If it is vehicular access that is required or if the opening in the perimeter wall is or needs to be quite substantial then Rapidam can be used to complete the perimeter defences whilst still allowing access onto the site. This also makes large perimeters cheaper to protect by taking the option of building relatively cheap walls to protect most of the site whilst the more expensive dam can be used to allow site access. Unlike other systems which are multi-component systems requiring a large amount of manpower, Rapidam is a single-component system requiring only minimal manpower/deployment time in comparison. Whilst other systems employ cumbersome, heavy engineering, Rapidam is a membrane system which uses water as part of the solution. The weight of water is used to seal the groundsheet down and to provide the stability to the entire system by retaining the back wall of the system via the tension straps. This eliminates the need for heavy components and means that 100m (or more) of barrier can be rolled and secured in around 30 minutes.